Well, it had to happen eventually. The final chapter of the hunger games franchise is finally here. The character that made Jennifer Lawrence a household name makes her final appearance which will probably leave some fans divided. I always found the Mockingjay book to be the weakest of the trilogy, and the same can officially be said for the movie. Granted, I may have liked the movie more had they just decided to make one movie instead of going for a cash grab by splitting the film’s up into two, but since they did split them up, we will never know. 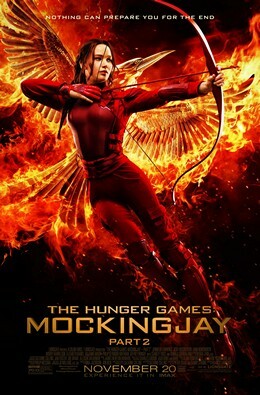 The movie picks up with Katniss recovering (rather quickly) from her injuries sustained from Peeta at the end of part 1. Peeta, having been brainwashed by the capital feels that Katniss is evil and lies to everyone for her own benefit. While the doctors try to cure Peeta, the rebels go to Panem to try and unite the districts in order to attack and defeat President Snow together. Although she injured in the process, Katniss’ speech helps unite the districts and the invasion of the capital is put in motion. While recovering from her injuries, Katniss is told she will not be joining the fight as her being the face of the rebellion, the risk isn’t worth the reward of her potentially being killed. So naturally, she sneaks away and joins the fight anyway. Knowing that the rebels are headed to the capital, Snow has his game makers flood the towns with traps to not only sabotage their invasion, but also make spectacles of their death in the same fashion as the hunger games themselves. While on their mission, Katniss realizes that Snow may not be her only enemy as President Coin, the leader of the rebellion seems to have ill intentions toward her. All leading to a heartbreaking finale, which if you haven’t read the books will shock you. Even having read the books, the visual is gut wrenching. Lawrence, is as always very good. Southerland is just as evil and menacing as he’s been on previous installments. Julianne Moore adds more depth as President Coin, and Woody Harrelson is terrific as Haymitch. The person who shines the most, but doesn’t get nearly as much screen time as she deserves is Jena Malone’s Johanna. She is a live wire on screen and its a shame to have wasted her in the last two movies. Also, there’s very little of the late Phillip Seymour Hoffman in the movie. Granted, he’s not in much of the book either, but its just sad when you realize this is the last movie that we’ll see the talented actor. While the ending is very identical to the book, the journey getting there isn’t as exciting as it is on the pages. The movie on the hole suffers from being too drawn out. Instead of making two movies that were over two hours, they could’ve fit everything into one two and a half or three hour movie. The series doesn’t go out with a thud, but not the bang that one of cinemas few heroines deserved.